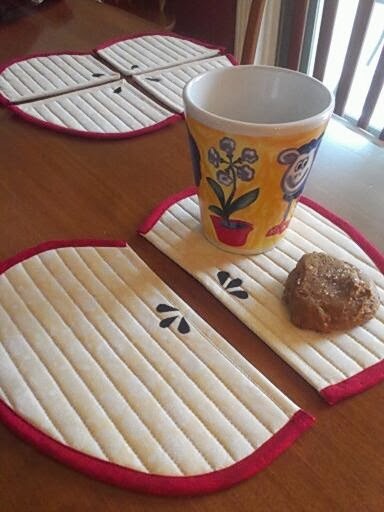 Have you sewn any mug rugs yet. I see them in books and magazines all the time, but have never made any until now. 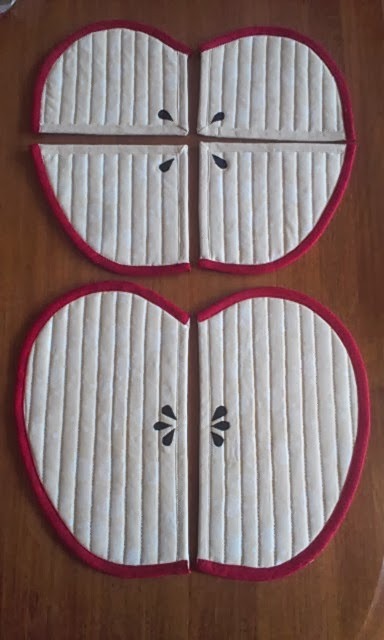 This free pattern from Interweave was originally for the four coasters but a little easy adjustment and you can have your self a matching set of mug rugs. If you didn't know, a mug rug is bigger than a coaster. Jut enough room for your coffee mug and a cookie. 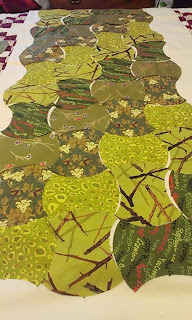 The pattern calls for a little green leaf on the top of one of the coasters. I may or may not put one on. I'll think about it. So, don't you think these are so cute for this time of year? Kids going back to school and an apple for the teacher. 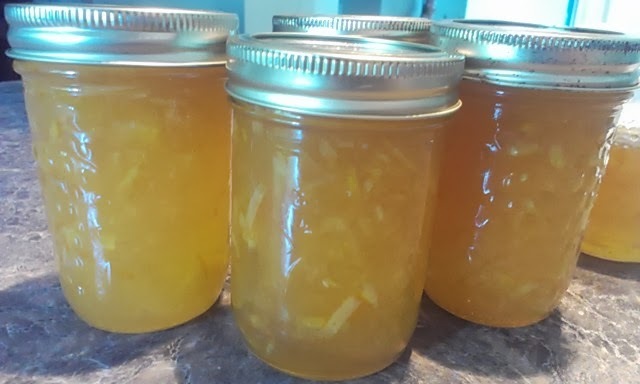 It's the first time I've ever made marmalade. I thought it would be harder. Hubby helped me cut the thin lemon and orange peel into fine strips. I used the recipe from the paper insert in the Certo Box. It's online here too. The online recipe gives a bit more detail than the paper insert. It says this is a slow setting jam, so we'll be patient and have a look at it in two weeks to see how it is. I think it's going to be a bit to tart for me. 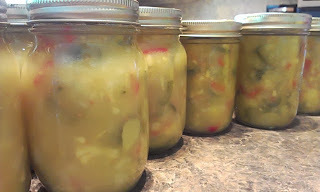 With a dozen pints of these delicious mustard pickles made, that concludes my pickle making for another year. Unless that is, if no one has any cukes to give away. If I do get some more cukes, I would like to give making another batch of cucumber jelly a try or even a batch of lady ashburn pickles a go. I haven't made them in years, so I would have to research a recipe. It's hard to change. 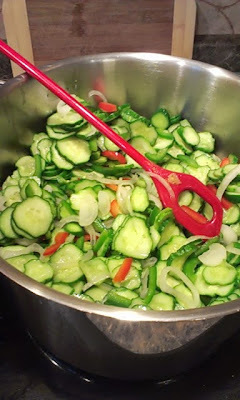 I make the same two kinds of pickles every year. It seems like the time goes by so fast. 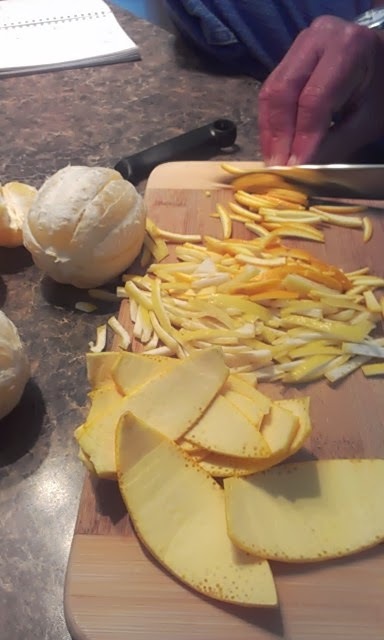 I love hand chopping the veggies. Even more, I enjoy a little pickle through out the year with my meal. 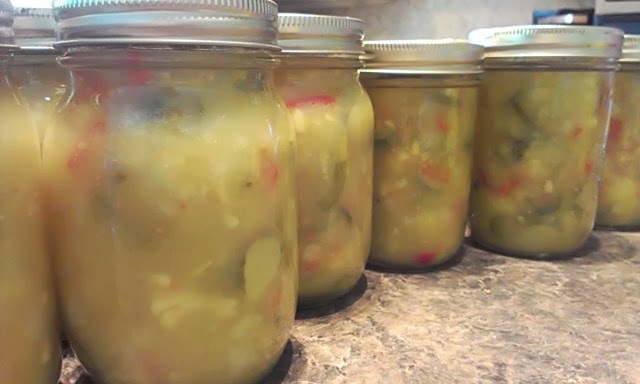 These are the Bread and Butter pickles. It's a very consistent recipe. I got it from my sister years ago. I must have made these 20 years in a row now. Makes eight or nine pints. Me and the Queen E.
Have you ever dreamed of travelling on the Queen E. or the Queen Mary. It's been on my bucket list for a few years. See, it all started last month when we bought new luggage. It's lightweight, sturdy and perfect for air travel. 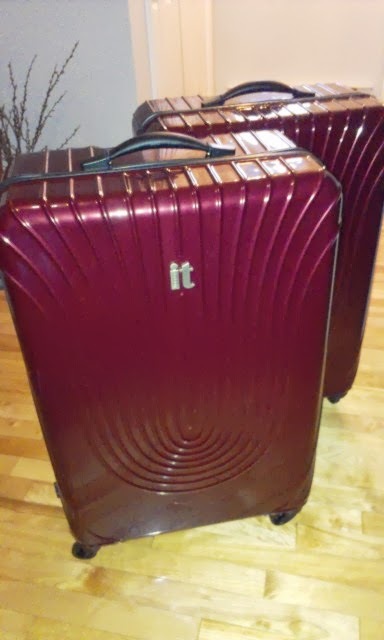 Once we got the luggage, and had no definite plans for travel in the near future, it got us thinking about taking this new luggage somewhere. So it's all booked.. Later in the fall, we're headed overseas and we're catching a two-week cruise in the Mediterranean. It's on the Queen Elizabeth cruise ship. I catch myself smiling while looking at the cruise itinerary. It includes a few places Venice, where I've been wanting to go for a while. And also includes a few places where we've been before like Santorini Greece. It's funny, I always thought, it's hard to plan to go back to a place that you've already been because, there are just so many other places to see. But because we have personal experience with some of these places, we are as excited to revisit some of these places and we know exactly what we're going to do in those places. 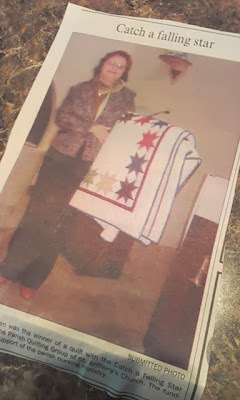 One of the guild members, Connie F. came to the June meeting lots of show and tell in a big Quilted tote bag. Have a look here. The pattern is an oldie but goody. When I saw it, I recalled how I loved it and said, I'm going to make one of those sometime. Well, I did cut a kit and it's been in my stash for some time. When I saw Connie's bag in June it got me thinking about digging out my kit and at least starting to piece the front. That opportunity came last week while my hubby was sick. Working 10 minutes at a time I have the cover of the bag pieced. I even got it layered and started machine quilting. There's some hand embroidery that now needs to be done on it before I can finish it up. 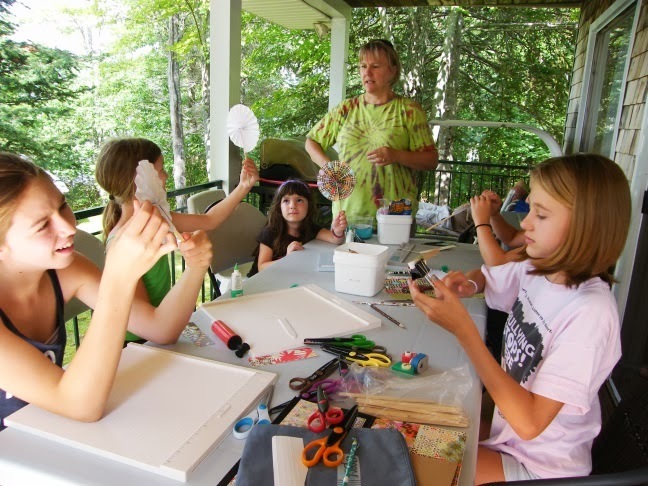 Maybe I'll get some of that handwork done cottage this weekend. Last week while reading the paper, I saw this quilt, and I said to myself.... "I know that quilt!" 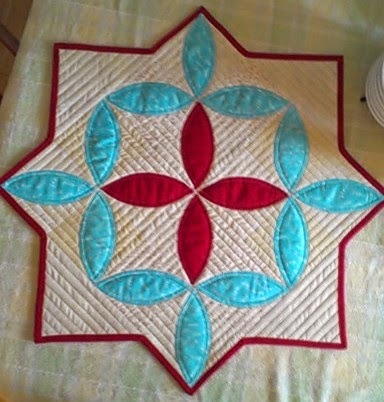 Sure enough it's the one that we finished hand quilting at the church last February. The church committee raffled it off and it was drawn on Mothers Day. Seems so long ago, but it was a nice surprise to see it in the paper. I hope the quilt will keep this lady warm this winter. My poor hubby has been sick. Not much sewing going on over the past couple of weeks. But he's on the mend now, and I've been spending a bit of time digging out fabric that I had put away for a specific projects. Some of the fabrics, I have totally forgotten what my intention was, so they got put back in my general stash. I found a little stack of green fabrics and after thinking for 5 minutes... I had recalled that I had saved these to do a small apple core project. I've had my Sizzix apple core die for some time, just waiting for the right project and right time. This die cuts little notches for matching the curved seams and it's going to be so helpful when pinning and sewing these cores. I cut out some paper templates with the die to see how to get the most cores out of the green fabric. Out of each of my 5 pieces of green fabric, I will get 16 apple cores. So with 80 cores, I'll be able to make two small table runner projects. I've laid out the first runner in an organized fashion. I'll do something different with the second. I'm a little behind in making my Veterans Quilt blocks. The last couple of weeks have been busy. But the good news is I just finished these ten over the weekend. So that almost brings me to the half way mark. It's not what I would call a UFO, but it's starting to feel like one. I will be glad when it's done. 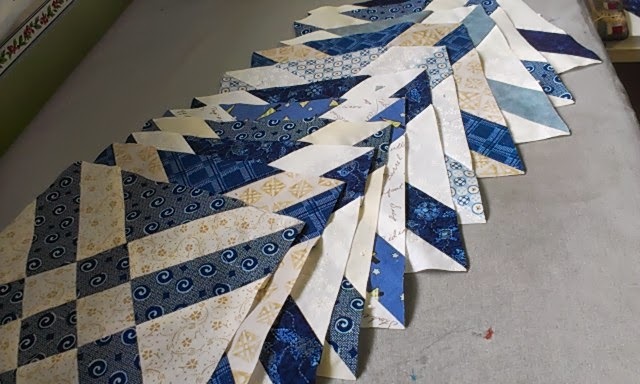 I really like Anita Grossman's Arrowhead block but now that I have 30 under my belt, I'm wondering if I should have made it a two block quilt. I'm bored with the blue arrowhead blocks's. I do have all the blocks cut out, so I'm not changing my strategy mid stream... but the thought did enter my mind, to make two veterans with these blocks... They would have alternating arrowhead and plain blocks.... oh, well. Time will tell.. The next few weeks look pretty clear I'll have no problem having all 63+ blocks done by the end of August. I'll decide how I'm going to put it together in September.. I made a special walk to the store this morning to pick up chocolate chips. 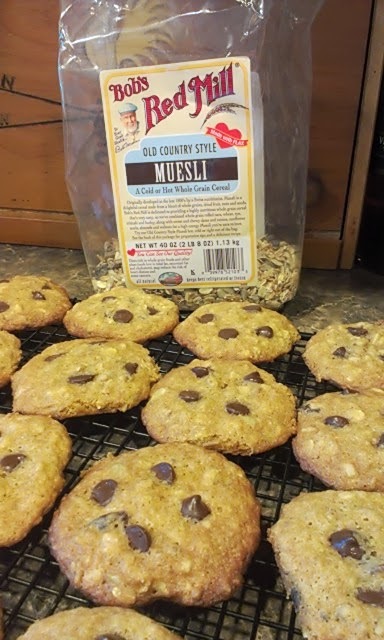 I thought I'd make the chocolate chip cookies on the Bobs Red Mill Muesli bag. They are a favorite in this house. I got home and nicely made all the cookies and had them on the cookie sheet to go in the oven. I realized I didn't put in the chocolate chips. 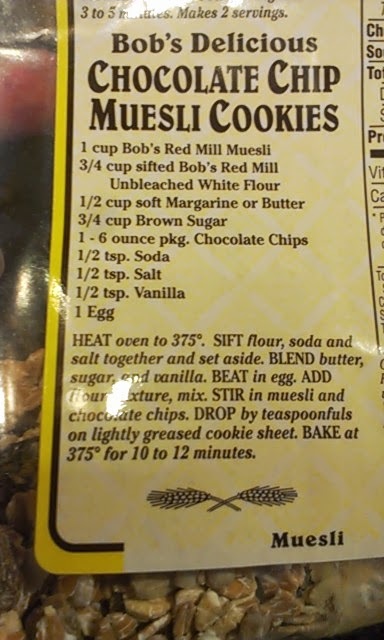 I considered cooking them without the chocolate chips, then I considered scooping all the dough and putting it back in the bowl and mix in the chocolate chips, then re-scoop out the cookies. But the lazy streak in me said, why not just put a few chocolate chips on top of each cookie dough ball. I did that, then put them in to bake. Do you suppose anyone will ever know the difference. They do look suspicious, don't they? I'm so pleased with how this "Winter Seeds" table mat turned out. I intended to be done earlier this week, but life happens, and it just got finished today. 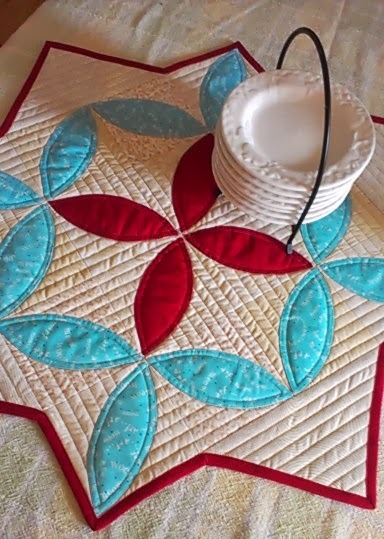 This table mat is for my sister. I have another already cut out for myself but I need batting, so after I get that, I'll finish it. 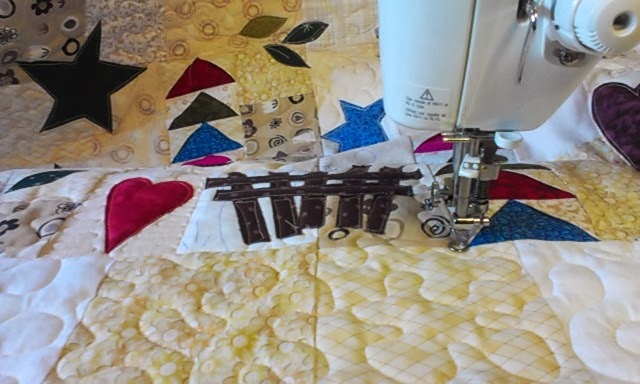 On this project, I found that the straight line quilting took longer than I expected. 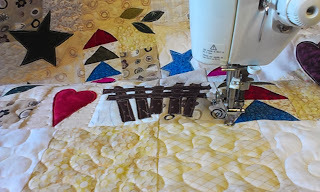 Free motion quilting would have been a lot quicker, but I love the look of these straight lines. And binding those inner corners was tricky. But if you are a quilter with intermediate binding skills, you'll have no trouble. 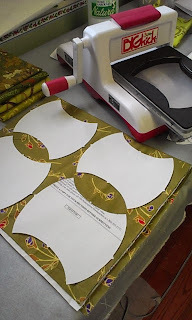 Many thanks to the Crafty Quilter for her free Winter Seeds pattern. I really enjoyed making this as my Christmas in July 2013 project. 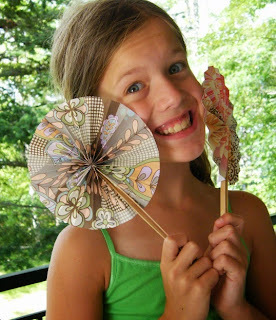 Do you remember making fans when you were in school. These fans are way nicer!! 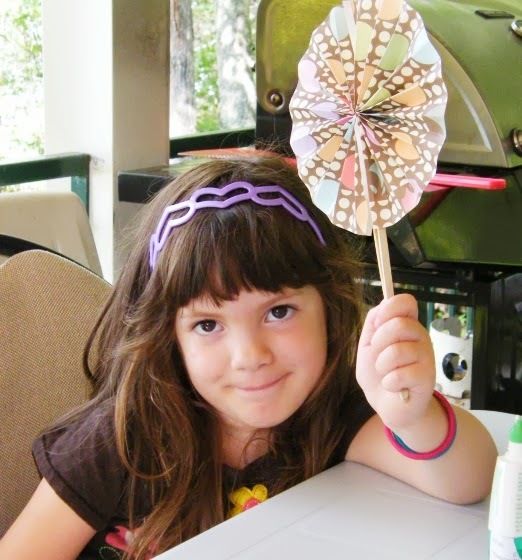 We used scrapbook paper and long wooden coffee stir sticks for the handle. My sister added an extra step of tying a piece of string in the middle of the fan so they would not flop over. They came out really nice. Want to try one for yourself, click here for the template page. We did not make curvy edges. 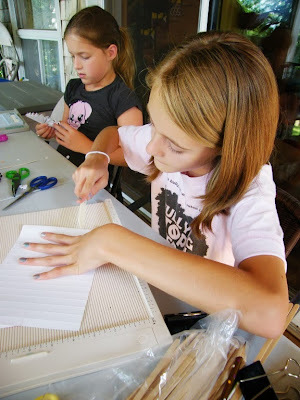 For these beginners, we cut 12" scrapbook paper in half and used the template on the half sheets. We scored at the the 12 inch length in the middle - 3 inches in. Then we scored along the short side, every half inch then fan folded. Note the little angled tab on the template. It needs a score too. It makes it easy to glue. At Grammie Camp, we always make an official Camp T-shirt. This year with our theme being LOVE, we made used a very special technique and made a heart design. After doing a special fold, the T-shirts have to set overnight to let the dye set. Then the next day, we had the big reveal. They are so beautiful don't you think? The kiddos sending out LOVE to you all. 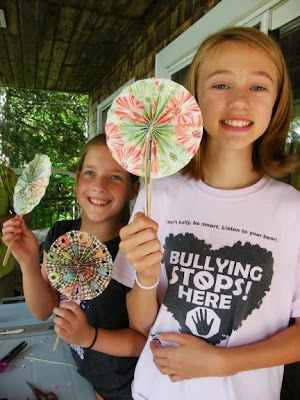 Do you want to make your own heart T-shirt, here is the youtube tutorial. Give it a try.